Sorry, I forgot to explain the pictures from last week. There is never enough time to email. The first one is of Elder Manning and me. In the picture I’m wearing the posterity tie Elder Campbell gave me. The next three pictures all go together in a really funny, cool story. Before I begin I want to same some things first. WE DID NOT HAVE THE INTENT OF BREAKING MISSIONS RULES NOR DO WE PROMOTE SUCH ACTIVITY. OK now we can begin. We were called the night before by our District Leader to see if we could do some service tomorrow. We said we could and coordinated with the other elders in our ward to go. 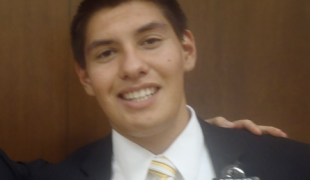 Elder Fertig’s new companion is Elder Rogers from Texas. He came out the same time as Elder Manning (12 weeks). He’s the one wearing a hat. The two other elders are Mickey and Mosile, new Samoan elders serving in the Nu’umau Ward. Elder Mickey came out the same time as Elder Fertig and Campbell (6 months). He was English but president changed him to Samoan. 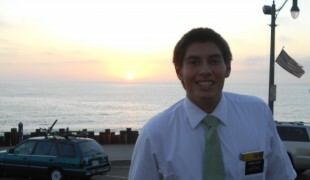 Elder Mosile is fresh off the plane from the island of Samoa. So Elder Mickey is showing Elder Mosile how to be a missionary and Elder Mickey is learning how to speak Samoan. They also came to do service. The service was for a lady in one of the sister’s area and she wanted Elders for heavy lifting. All we were given was an address that turned out to be wrong. The next day we drove around the neighborhood looking for a moving van cause we called the lady and found out we were helping her move. We got there and she wanted to fit a bunch of stuff in a small moving truck. Amazingly we were able to do it. She is the older Brazilian lady in the picture. Luckily we didn’t have to move everything cause somebody was still living there. She was moving to a friends house. She asked us to help her unload also. We weren’t sure because we had stake conference later that night. She said it was only 7 miles away in some city called San Pedro. We said we would. 40 minutes later and after driving through Palos Verdes (super rich homes) we finally stopped. We realized that we were in the Long Beach mission. We helped her unload and saw the inside of a multimillion dollar home. So the green couches are designer couches and in no way ever will be inside our apartment. The other younger lady I assume is her daughter and the daughter’s husband took the picture. It was really cool. The view was awesome and the best part was that I saw the ocean for the first time since being in California. We hurried back to our mission and didn’t get struck by lightning at all! I have been praying for investigators since our area has been slow. This last week we have 6 new investigators. Hopefully they can become progressing and come to church. The biggest problem is that people are comfortable where they are at and don’t want to change. We have been visiting less actives and some of them are coming to church now! The other day someone parked in front of our garage, so we couldn’t get out. We decided to be nice and bike. We biked about 12 miles and I thought I was about to die. It was really hot. In the 90’s, and September and October are the hottest time of the year. We might get in the 100’s soon. Good luck in your family history class, mom! Take care Dad! My new favorite scripture is D&C 121:45 I love the promise in the end. Charity has allowed me to become such a better missionary.